Thanks to his match-winning exploits in Italy’s Euro 2012 semifinal against Germany, Manchester City’s Mario Balotelli is once again drawing a huge amount of interest. Standard fare for Super Mario, though it’s admittedly for far better reasons than what he’s normally drawing everyone’s attention for. balotelli has been a photographer’s dream over the course of euro 2012, and he’s captured the interest on the interwebs in the process. So with interest in the mercurial front man once again at peak levels, the masses have taken to the internet to learn more about the enigma that is Mario. In fact, since logging his brace against the Germans, Mario’s name has been the most frequently occurring word used in search phrases that have landed visitors on my site… which makes sense, as I’ve written a good deal about the troubled youngster. But the thing is, not everyone goes for the run of the mill searches when it comes to Balotelli. In fact, many choose to search from something way outside the norm, like “And for one reason or another, I thought those random searches about Balotelli news were hysterical. So to help myself understand what people could have possibly been looking for, I took to Google Images with the top five Balotelli search terms that ushered visitors to the site. Where to start with this one. Of course, front and center is Super Mario on this super small bike, and that’s plenty “funny” on its own. Is he riding it out of a kitchen, or a mechanical room? I’m not sure, but he looks huge on that thing! Mario, himself, appears to be having a grand old time, too. But where this picture really becomes awesome is in the background: just over Mario’s back, there’s a grown man… with his face… painted like a tiger. What is going on here!?!?! 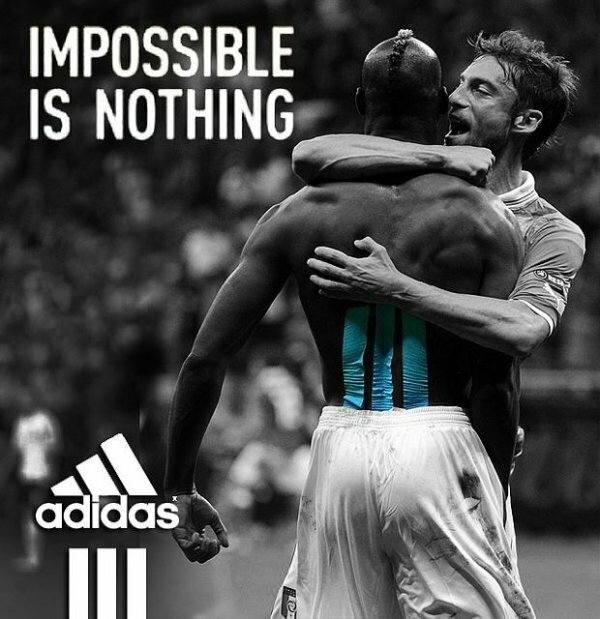 Let’s get something straight: Balotelli is a Nike athlete, and has been for quite some time. So when I first saw this phrase coming up, I wondered if I had missed him making a shock boot switch during the Germany match. But when I first Googled it myself, this is one of two images that kept coming back up. When Balo ripped off his shirt to celebrate one of his goals, he revealed three strips teal of kineseo taping on his lower back. Reminiscent of the iconic “3 stripes”, some clever internet hooligan quickly dressed the photo to appear like an Adidas ad. Though what I found highly ironic about the image he chose to do above? Balotelli getting a stupid yellow card is as far from impossible as is possible; it’s practically a given. 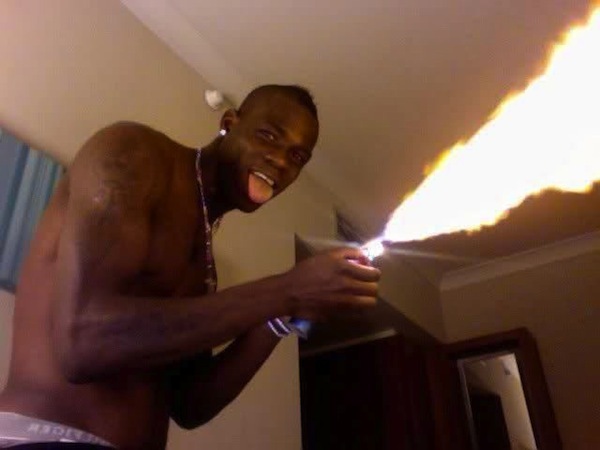 There are a million images that I could have chosen for the above search term, but this one of a teenage Balotelli creating a MacGyver-style, home-made blow torch I think illustrates it the best. Who knows what he’s using for fuel — my gut tells me hairspray — but after seeing this picture, it makes me think that none of us should have been surprised when he lit his bathroom ablaze with fireworks. If there’s one thing that Balotelli has been known for (aside from being an idiot), it’s his dynamic choice in hairstyles. The kid has literally rocked a billion different do’s over the last few years, ranging from tire treads to African abstract art. But the best style I’ve seen him show up in yet hails from the Nike Barbershop adverts, where Balotelli turned down this killer Carlos Valderrama look… the moustache is what really ties it all together. You know something, Sepp Blatter was right when he said there’s no racism in football anymore. There haven’t been any incidents amongst the players, the fans or the press. Just like the image above from Italy’s Gazzetta dello Sport: it’s clearly not racist, right? And since Balotelli was a defender against England, this image makes perfect sense. Wait… none of what I just wrote makes any sense, at all.